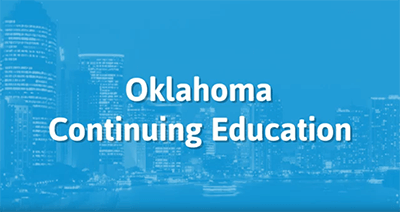 This 19 hour continuing education course with 1 hour of mandatory flood credit is intended for Oklahoma licensed insurance producers and provides instruction in a number of useful areas. The course begins with an overview of the general principles of insurance, including a short portion on the concepts of risk, and another on the relationship between producers and insurers. Then the instruction will compare and contrast dwelling insurance policies and homeowner’s insurance policies. This segment will include a section that consists of an in-depth look at the most common types of commercial insurance coverages, and how the producer can help a client acquire the types of commercial coverages that will best suit their needs. The student will then spend time learning about the federal regulation of property and casualty insurance, which will allow the producer to better operate in accordance with those regulations. It will include the impact of federal regulations under the Federal Credit Reporting Act and the Gramm-Leach-Bliley Act. Following this segment, the student will receive instruction in aspects of flood insurance and the effect of the NFIP on our industry and on consumers. Then the student will be provided with instruction on the topic of renters and condominium insurance, its potential benefits, and applicability for clients. Following that we’ll examine the current topic of toxic mold in dwellings, that will include pertinent advice we can pass on to our clients. After looking at specific insurance, we’ll step back and take a more broad-based review of the subject of money laundering and anti-money laundering efforts in America today, which will include steps we can take to protect ourselves and to prevent these crimes. Following the course of instruction, there will be a final exam to help the student retain the covered subject matter. 10. Commercial General Liability Section II: Who is an Insured?